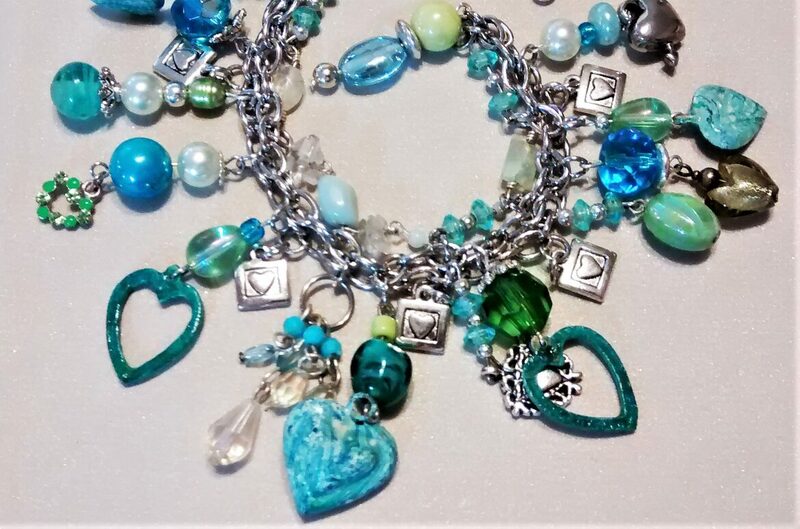 This is a charm bracelet made of teal and green drops and heart charms. 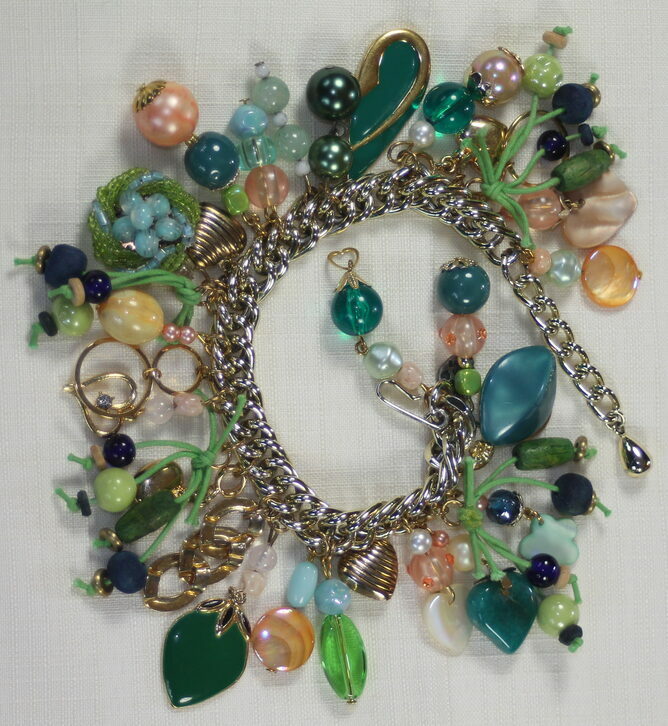 All kinds of beads- clay, crystal, acrylic, glass. A wonderful mix that blends beautifully. 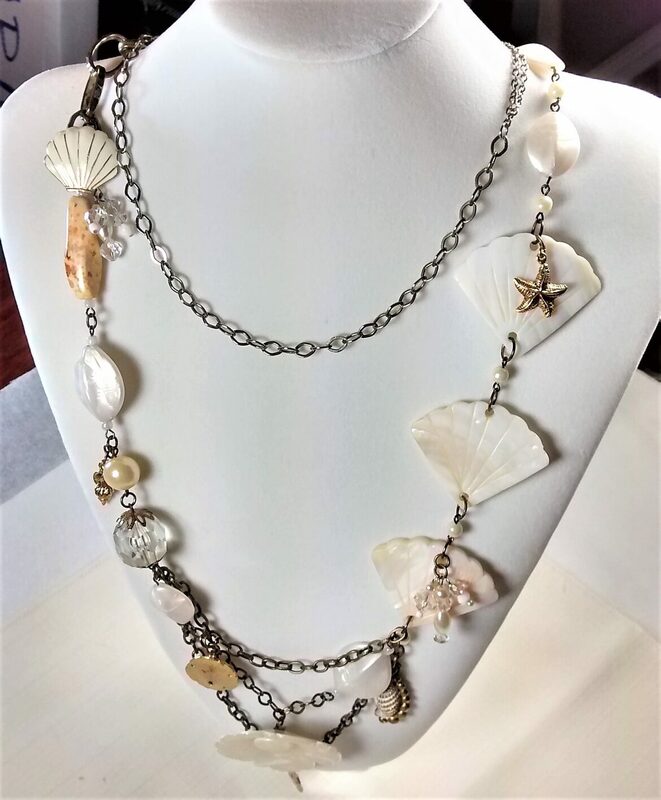 All on a silver toned double chain with silver toned findings. 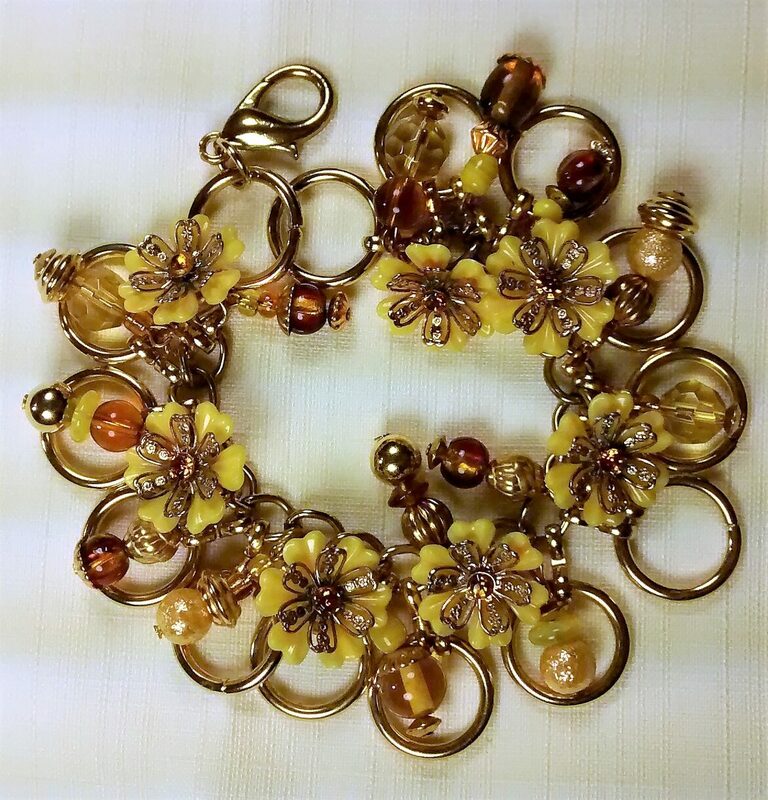 I have used upcycled or repurposed materials and new elements for this bracelet. This is made for the larger wrist- 8 1/2". It can be easily down-sized for your wrist size. Just let me know when ordering. This bracelet is sure to be a conversation starter. Each piece I make is unique. 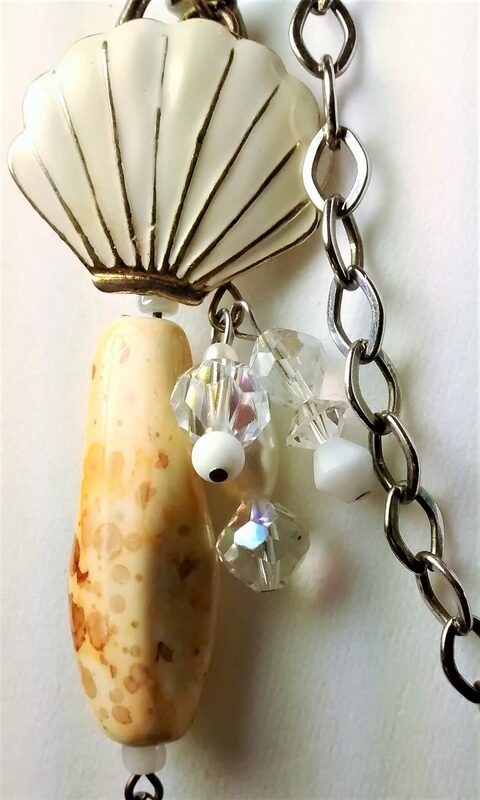 One of a kind elements are often used with new and vintage finds. Remember, I charge one flat fee for shipping ($6.45) no matter how many items you order at one time. Thank you. 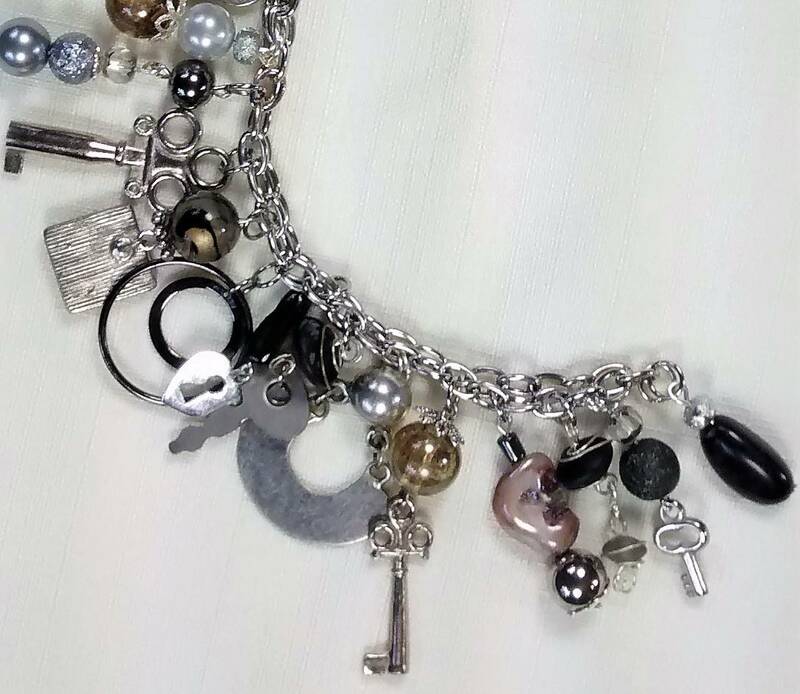 This charm bracelet has keys and locks all around. Black and grey drops of various materials accent this. It has a double steel chain with a silver finish with sliver tone findings. 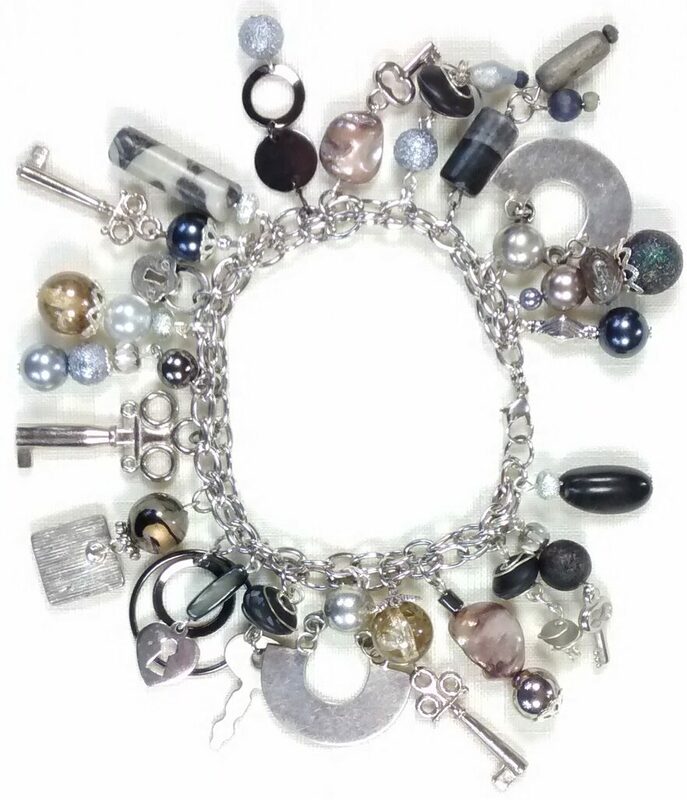 I have used upcycled or repurposed materials and new elements for this bracelet. This is made for the larger wrist- 8". It can be sized down for your wrist size. Just let me know when ordering. Each piece I make is unique. 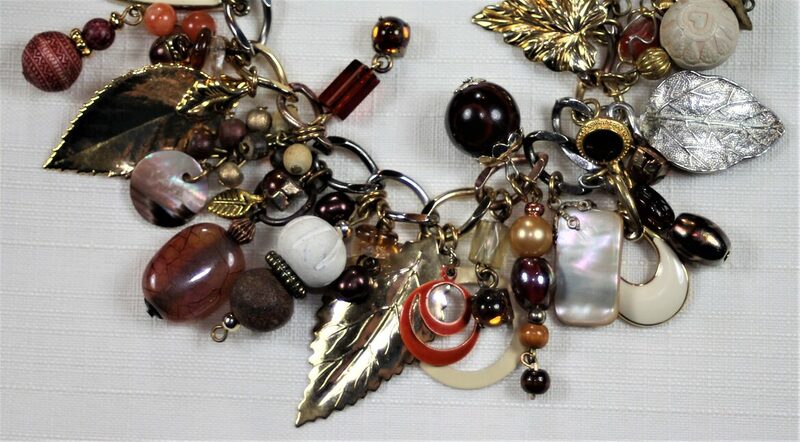 This is a charm bracelet made of gold, bronze, orange, and cream drops. Lots of shine and bling with a leaf motif all around. 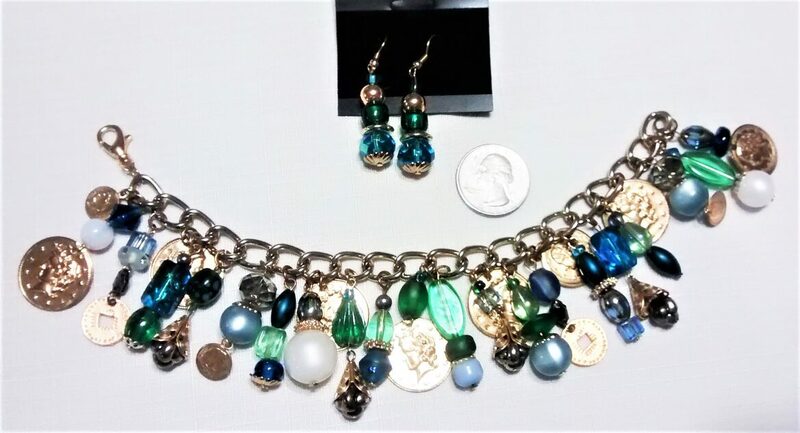 All on a 3 colored chain with gold and silver findings. This is made for the larger wrist- 8" with an extender. It can be easily sized down for your wrist size. Just let me know when ordering. 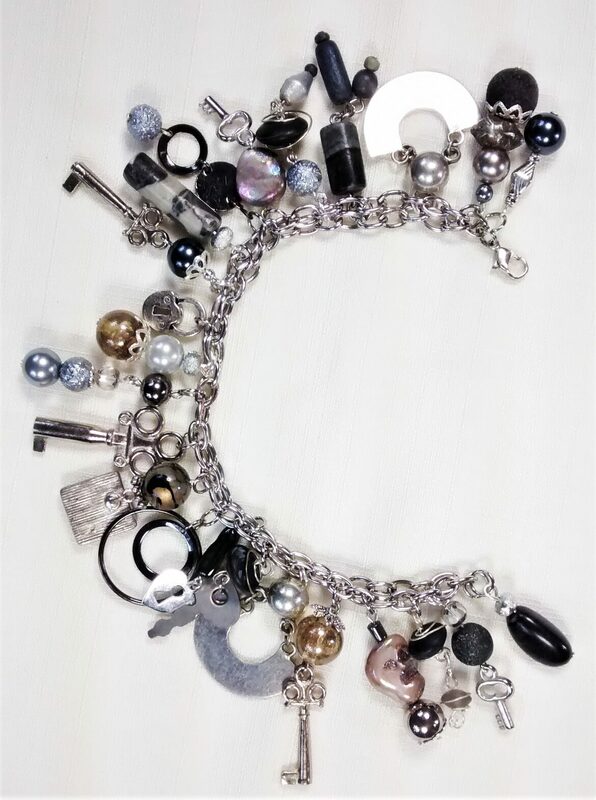 This is a charm bracelet that also converts into a necklace. 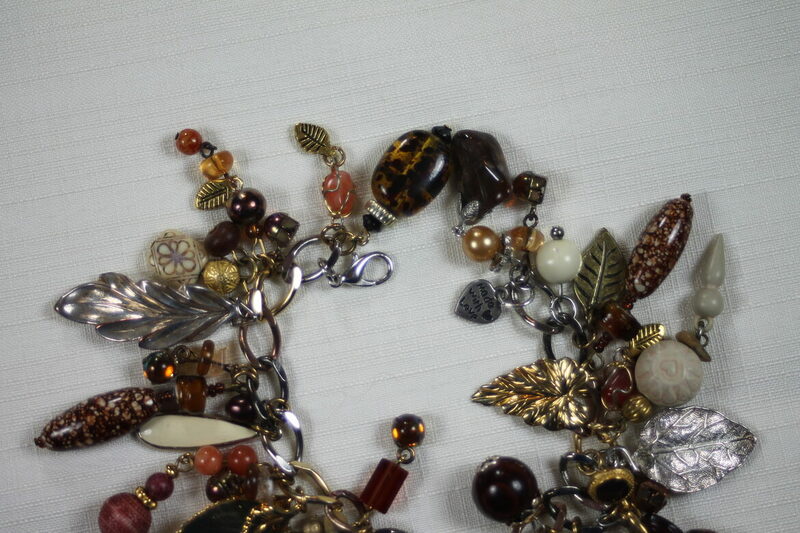 It features an additional BUTTERFLY DROP that can be added to the necklace or bracelet, or not at all. A monochrome color palette of warm oranges, dark and light peaches. Yumm. It is on a gold colored book chain with gold colored findings. 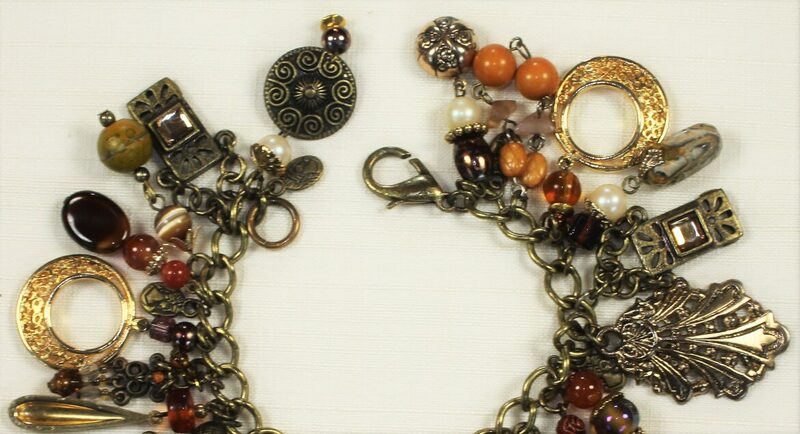 The additional chain, for the necklace conversion, is 24 inches in length. Total is 32 inches together. 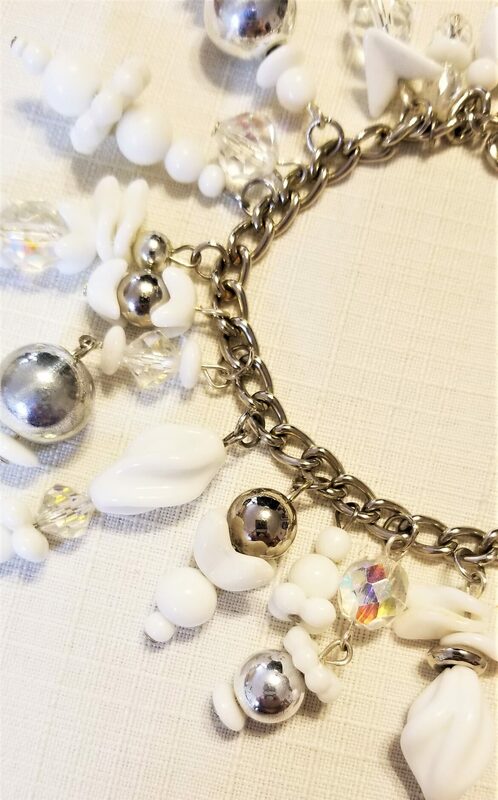 This bracelet will always be in style with lots of bling. Each piece I make is unique. Remember, I charge one flat fee for shipping ($6.45) no matter how many items you order. 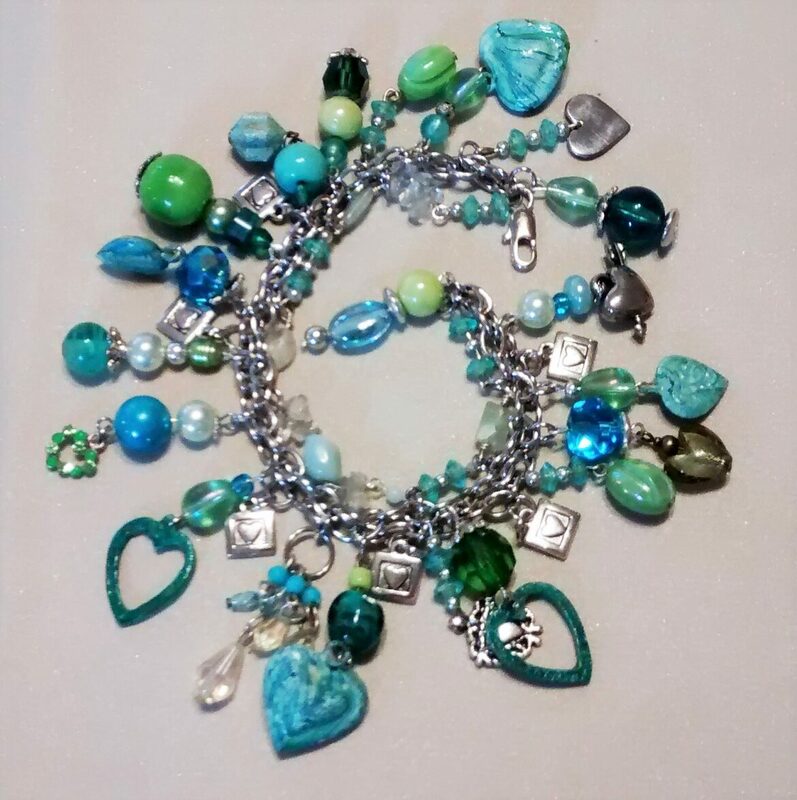 This is a charm bracelet made with faceted glass and crystal turquoise drops. Accented with gold coins for a little jingle. Very eye-catching. 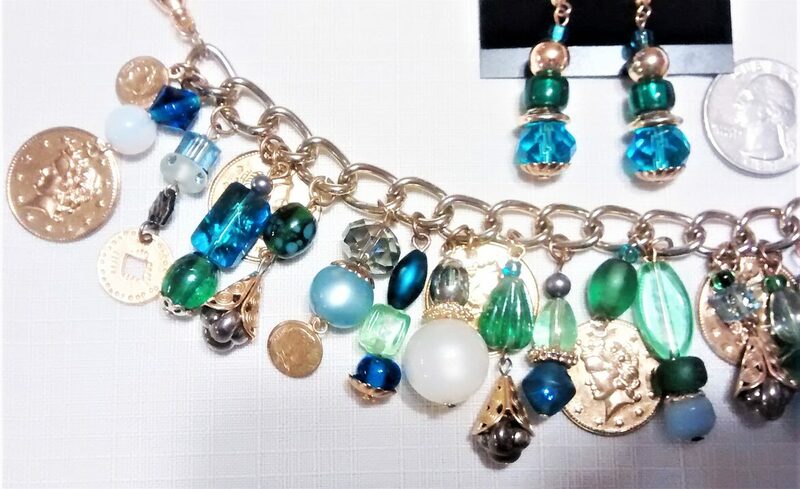 This bracelet comes with matching dangle earrings of turquoise and gold. French wires for pierced ears. All on gold tone chain with gold beads and findings. This is made for the larger wrist- 8 1/2", but it can be easily sized down for your perfect wrist size. Just let me know when ordering if you would like it customized (no charge). 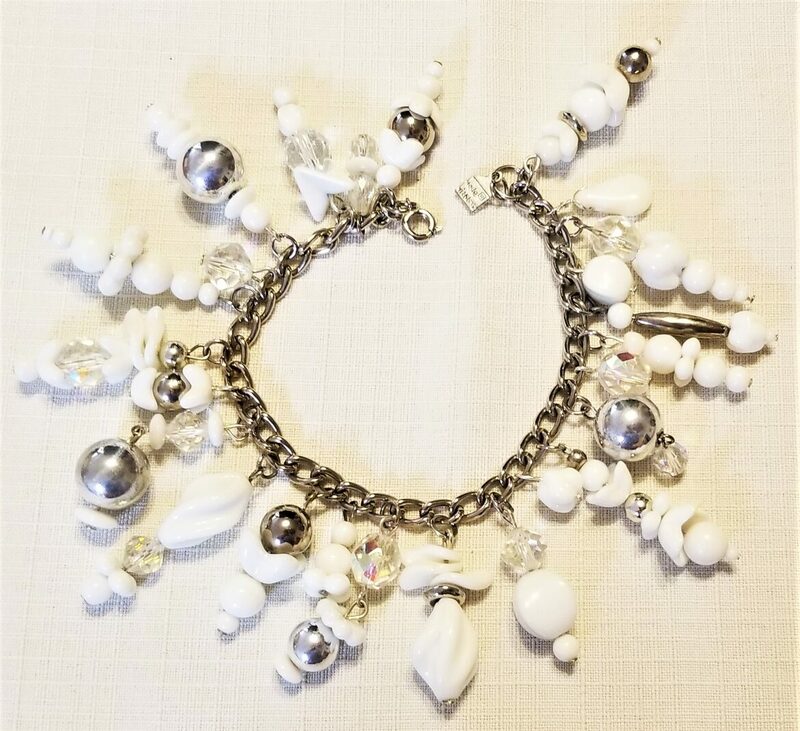 This charm bracelet is made with white, vintage, German beads of various shapes. Crystal beads along with silver tone beads are mixed throughout. This practically goes with almost everything. It has a steel chain with a silver finish with sliver tone findings. 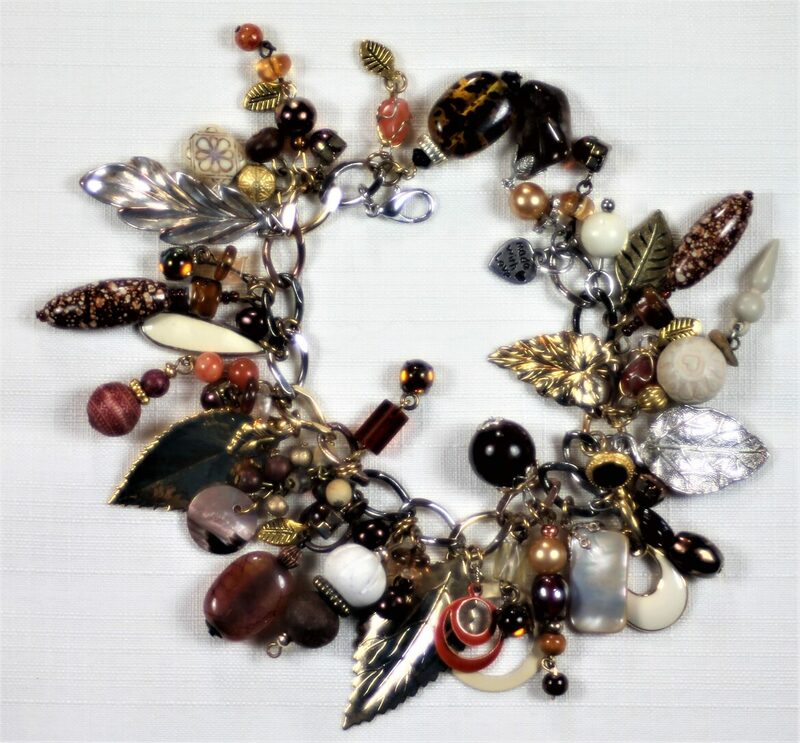 I have used upcycled or repurposed materials and new elements for this bracelet. This is made for the larger wrist- 8". It can be sized down for your wrist size. Just let me know when ordering.Each piece I make is unique. Remember, I charge one flat fee for shipping ($6.45) no matter how many items you order. Thank you. 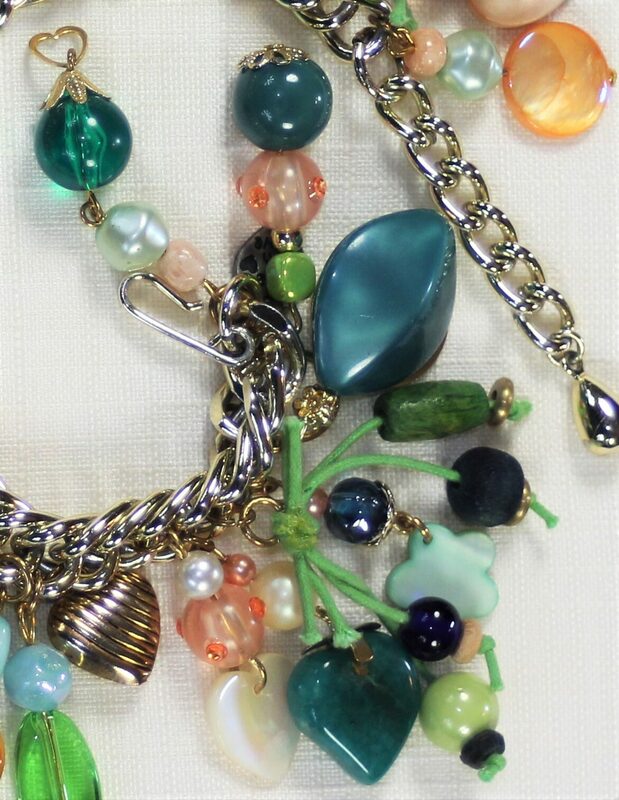 This is a charm bracelet that is made of all types of drops in peach and teal. 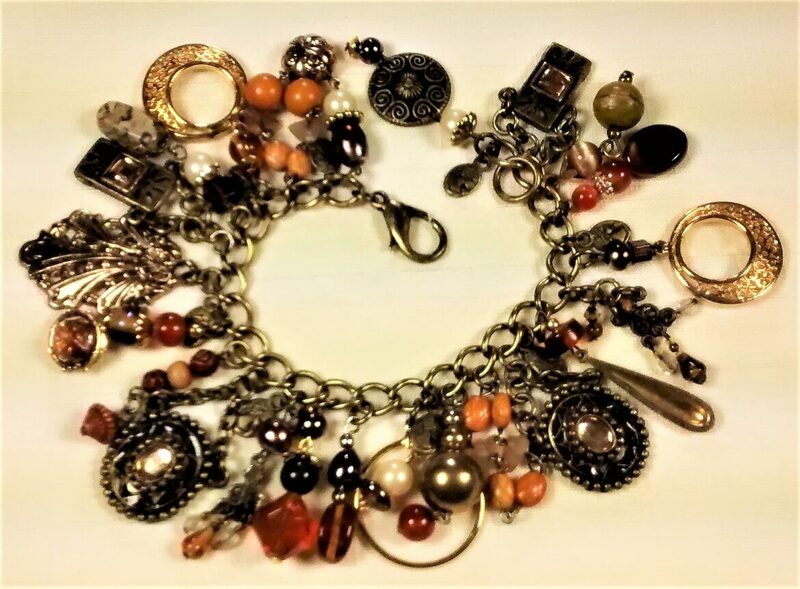 Vintage and new beads and components used together to create a one of a kind eye catching bracelet. 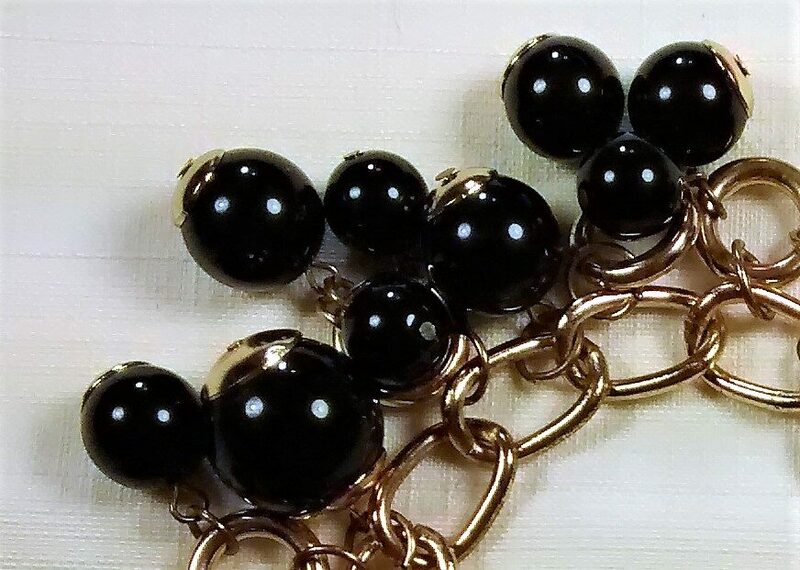 It is on a bright, heavy, gold colored chain with gold colored findings. It looks like it is silver in the pictures, but it is actually gold tone. 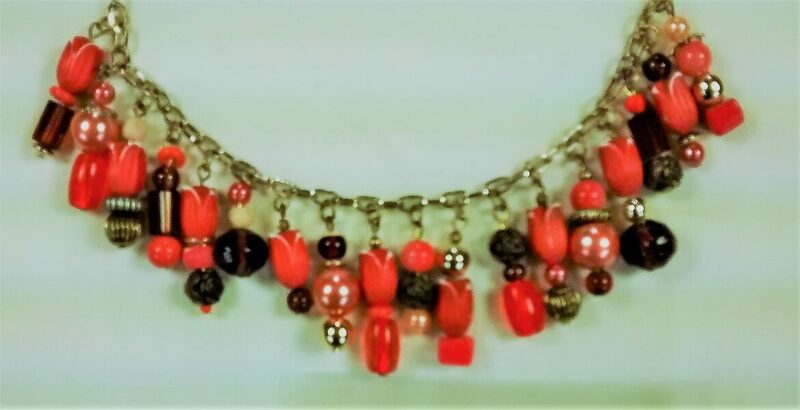 Lots of sweet, bright, orange, vintage tulip beads with complimentary drops of brown, peach, and orange, create this fun charm bracelet. 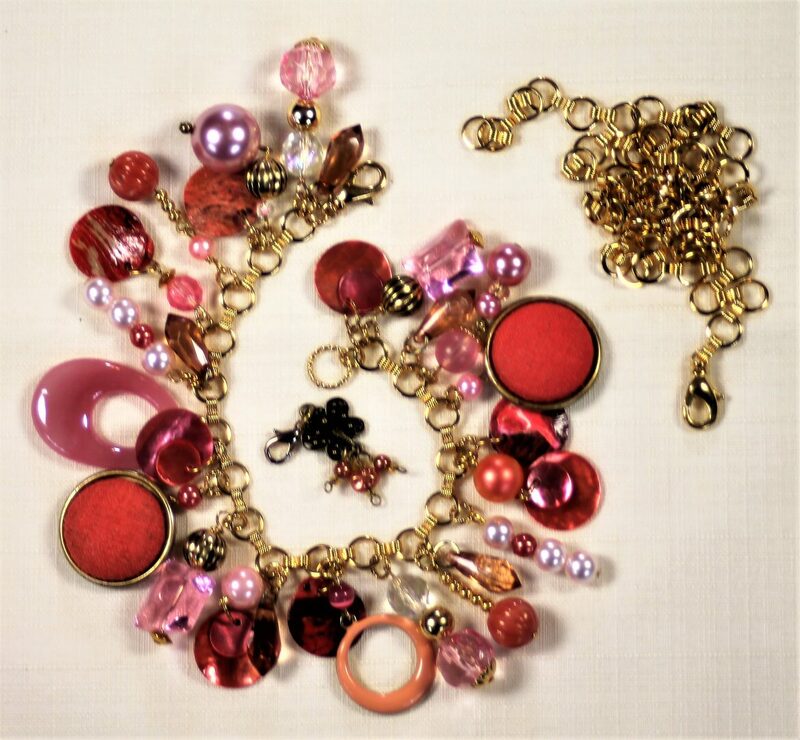 It has a gold tone chain with gold findings and antique gold rose beads. This is made for the larger wrist- 8". It can be sized down for your wrist size. Just let me know when ordering. Certainly a conversation starter. 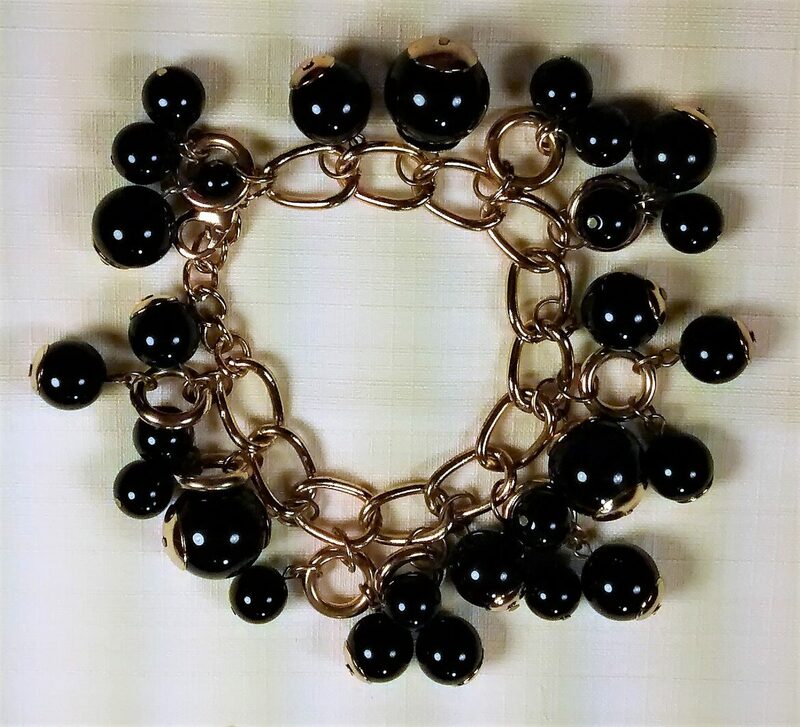 This is a charm bracelet made of black glass drops, accented with gold, of various sizes. This makes a dramatic statement. All on a gold chain with gold-tone findings. This is made for the larger wrist- 8" with an extender. It can be sized down for your wrist size. Just let me know when ordering. 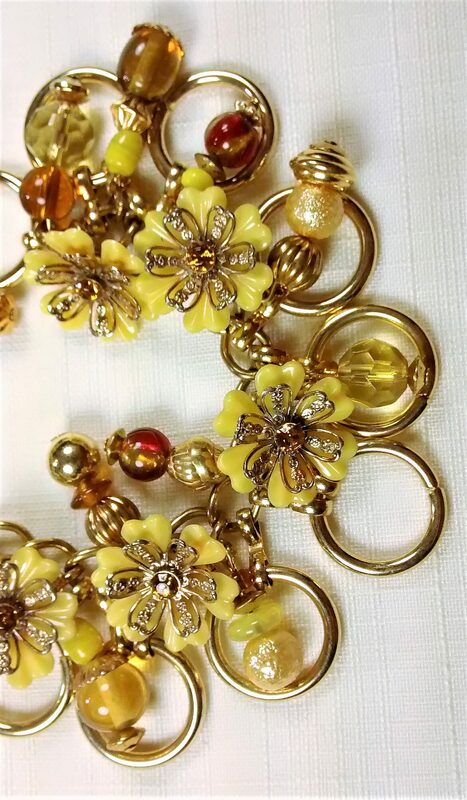 This is a charm bracelet made of yellow acrylic daisies with rhinestone centers. 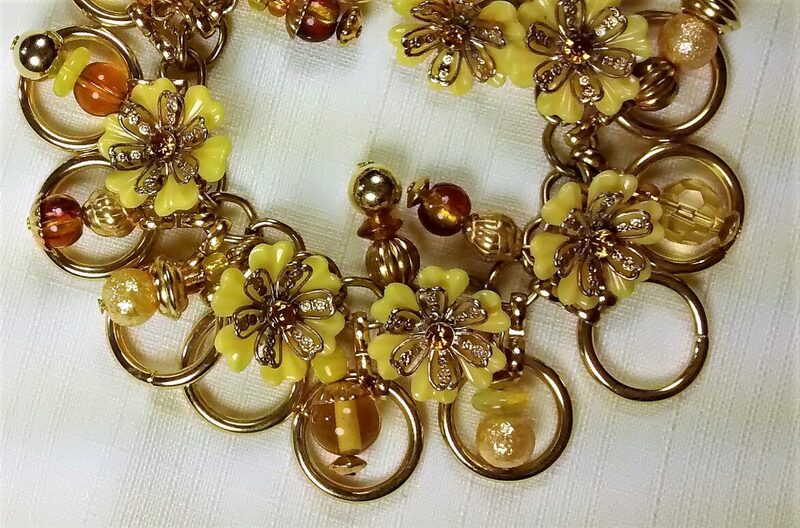 Accented with gold and crystal glass drops. Bring a little sunshine into your life. All on a gold chain with gold-tone findings. 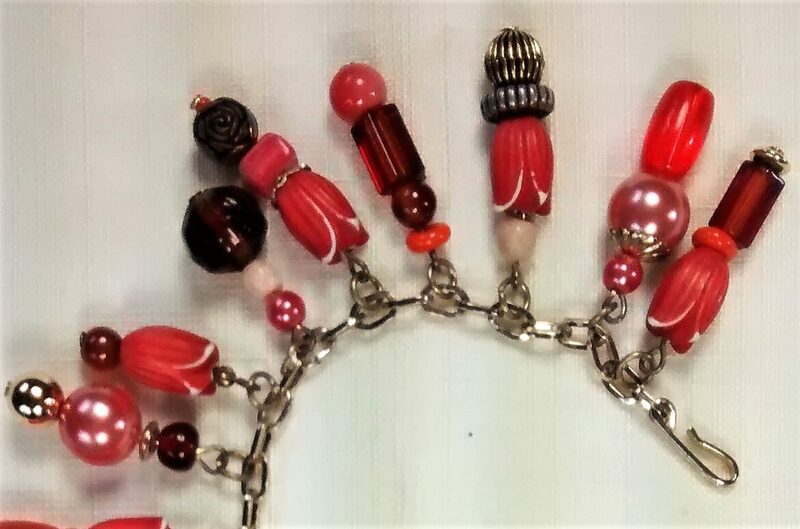 I have used upcycled or repurposed materials and new elements for this bracelet. 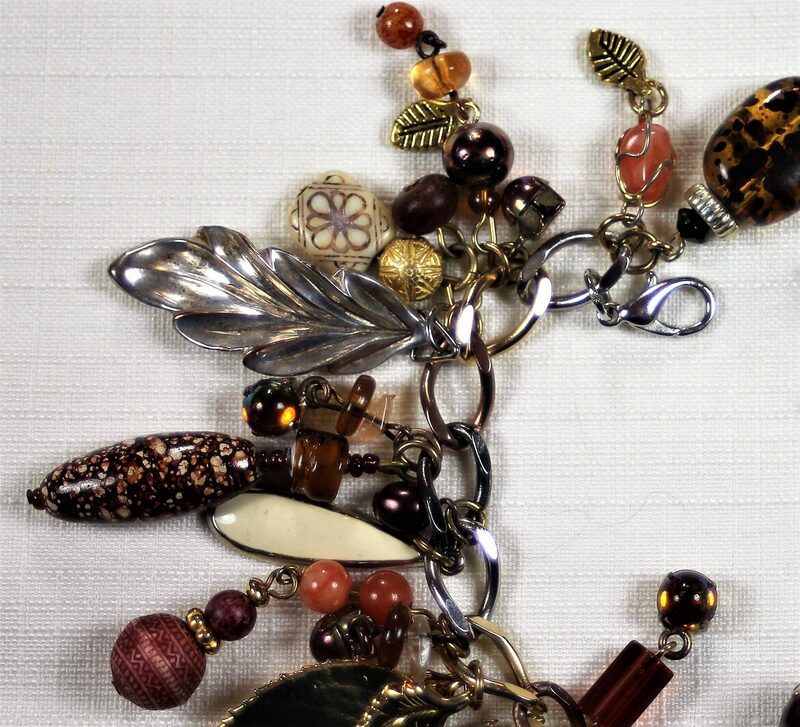 This is a charm bracelet made of all types of drops in bronze, gold, amber colors with lots of shine! 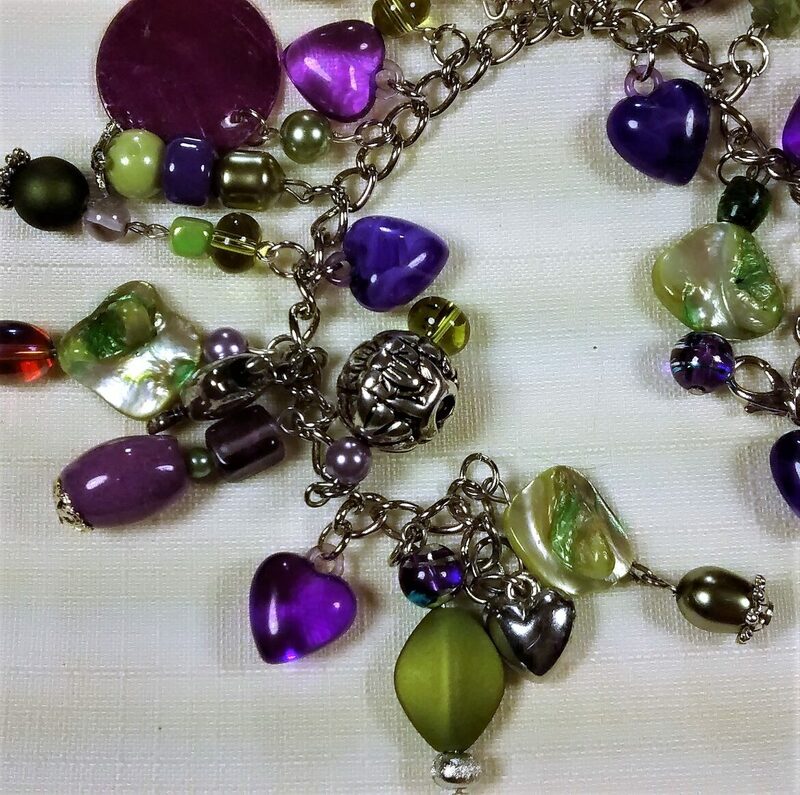 I have used upcycled or repurposed materials and new elements for this bracelet. 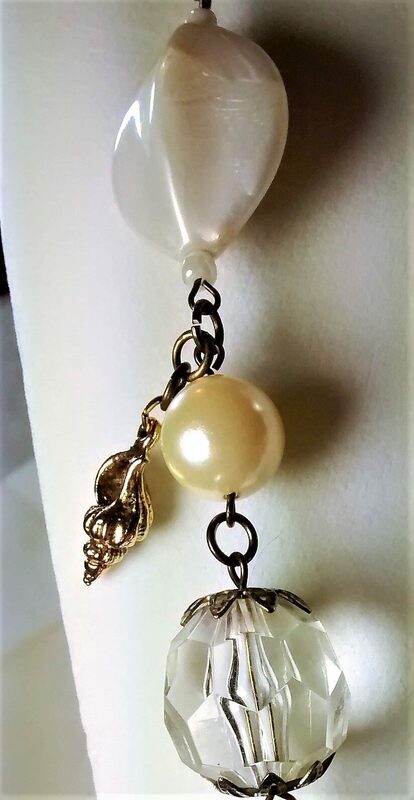 It is on an antique gold colored chain with gold colored findings. 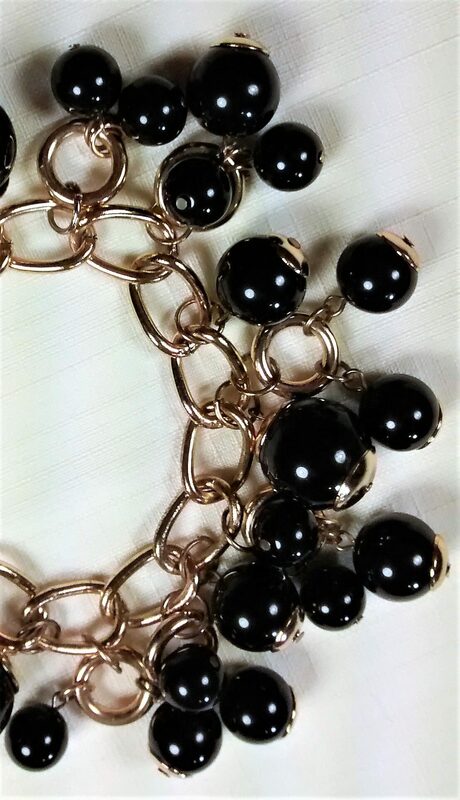 This bracelet will compliment all kinds of outfits with sparkle. 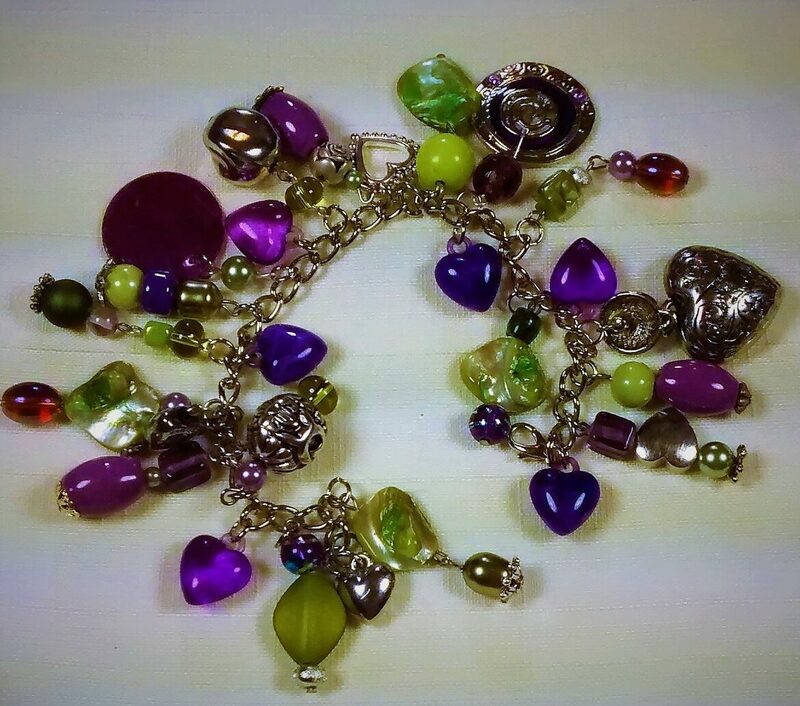 This is a charm bracelet made of all types of bobbles of lime green and multi purple drops. 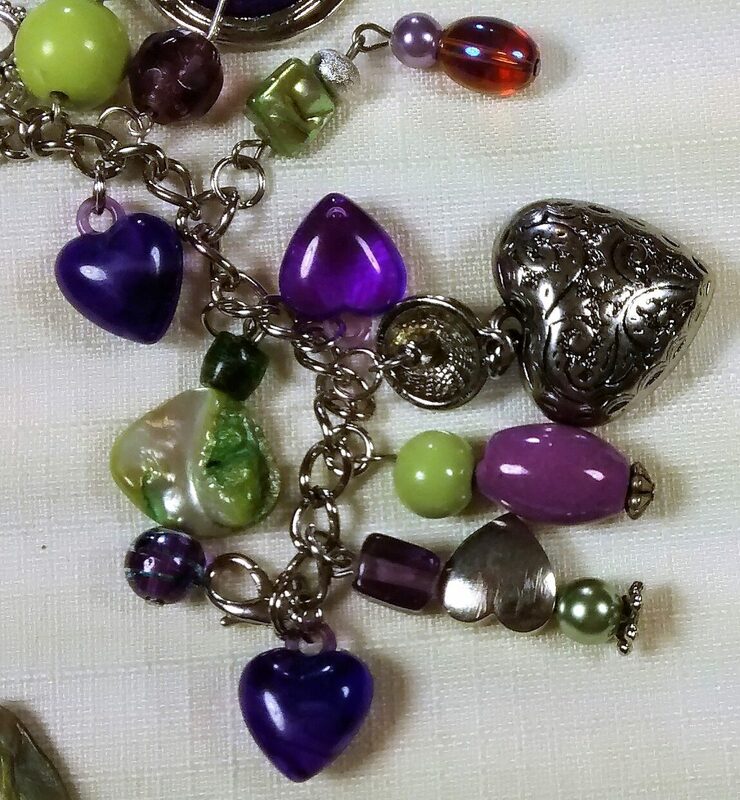 Some of the purple hearts look more blue in the pictures, but they are actually dark purple. Accented with hearts all around. 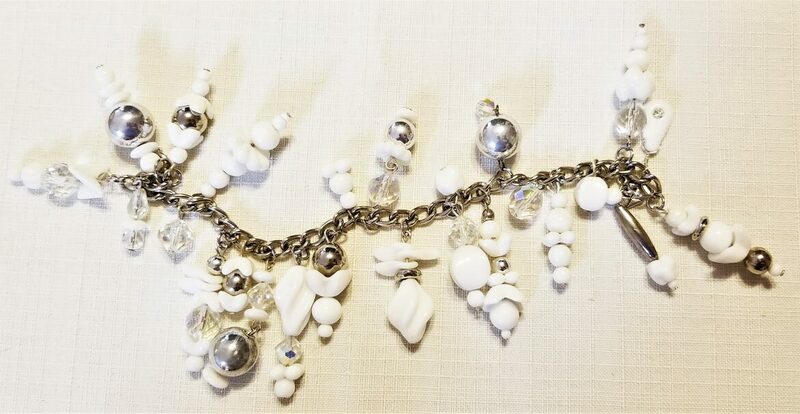 It is on a silver colored chain with silver colored findings. 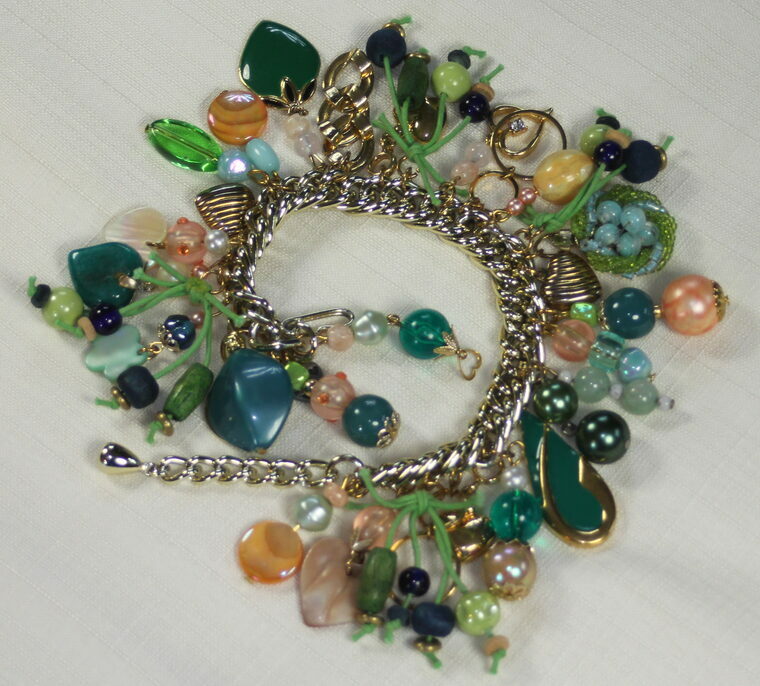 This bracelet is a show stopper. Each piece I make is unique. 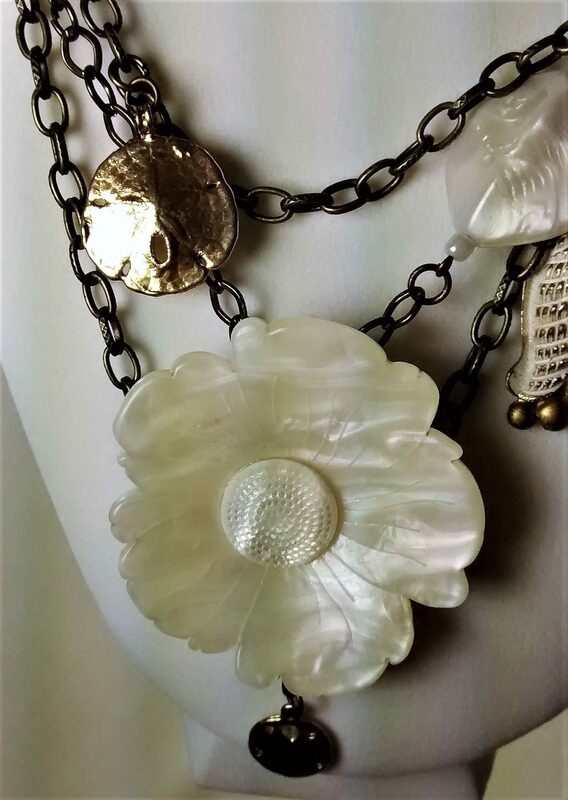 This is a necklace with a monochrome color palette of cream and off-white. 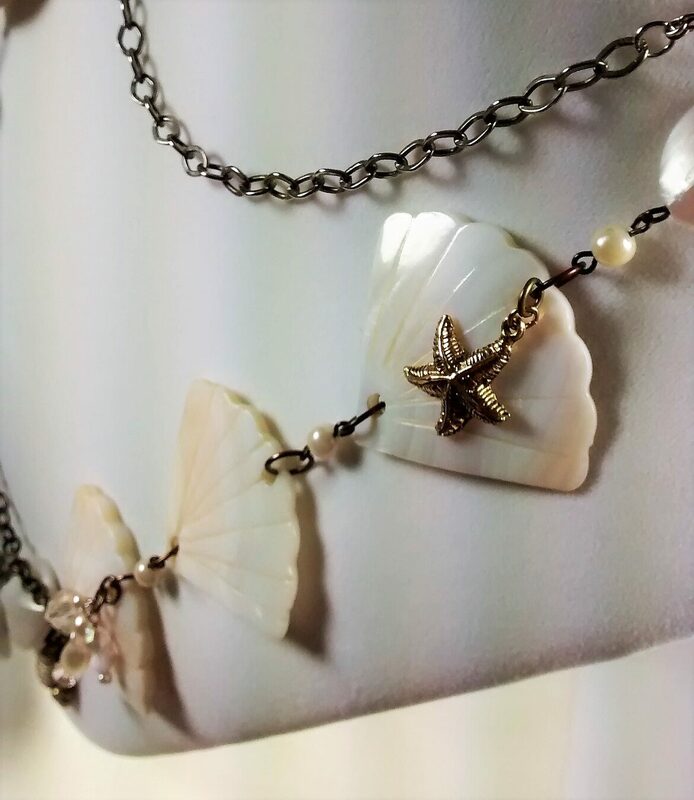 There are Mother of Pearl shells and gold drops all around. 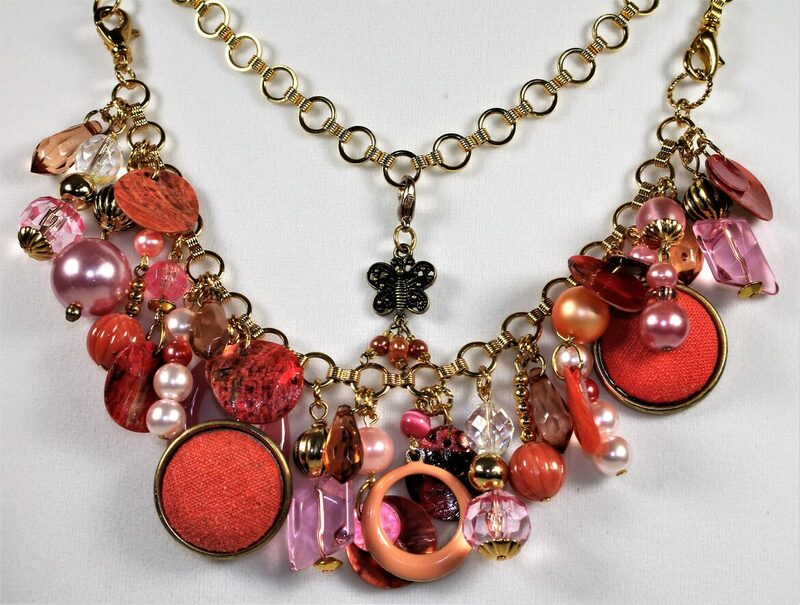 Highlighted with crystals and charms. 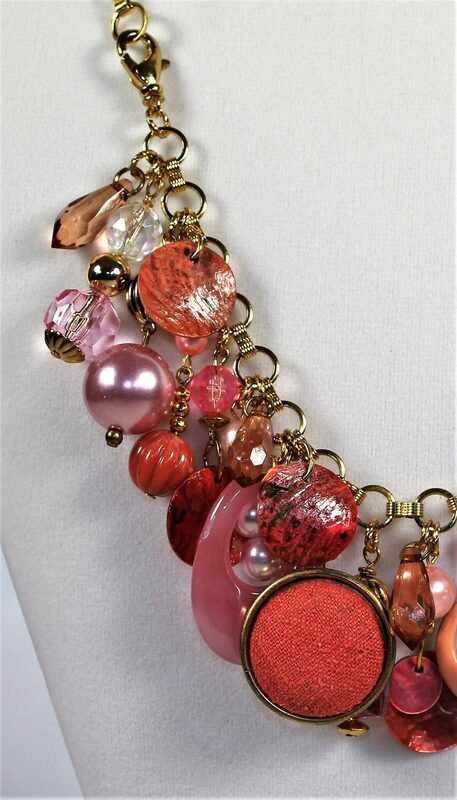 It is a piece that can be worn all year around. 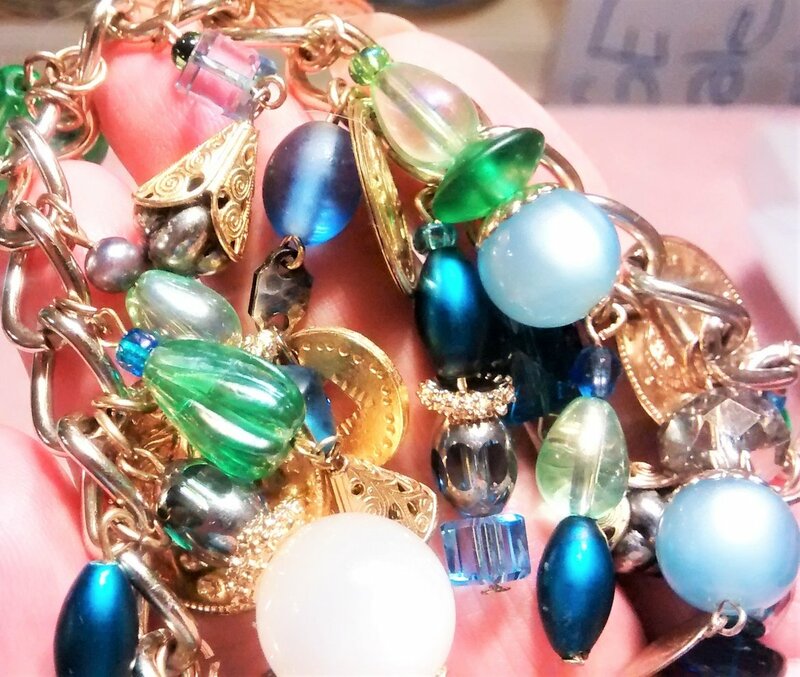 It is on an antique gold colored chain with matching findings. 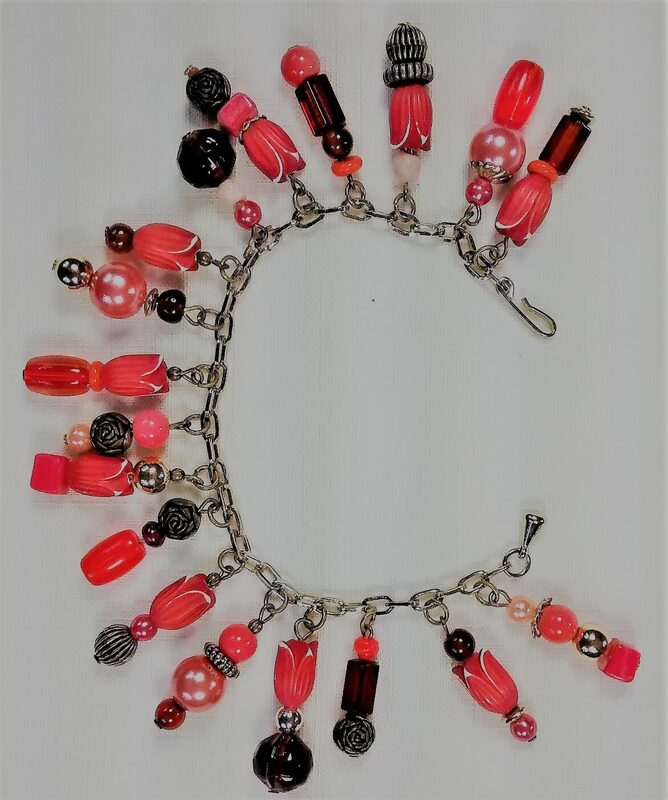 The piece is 44 inches in length and can be worn in several ways.